The will of a former Portreeve of Kenfig made in 1605 shows that the burgesses were raising money towards building a new town hall here at the time.Its erection marked the removal of the "Town of Kenfig" from Maudlam (where it had been re-established following the abandonment of the old town) to the site of the present village. In form they tried to recreate the first-floor hall with an external staircase that had graced their medieval town. There the ground floor had been occupied by the town's market, but with these now a thing of the past, they apparently took the decision from the first to utilise this area by making it an inn. 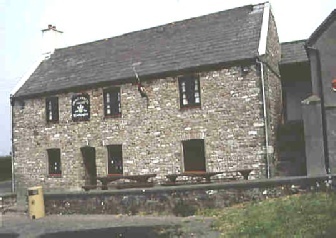 Both hall and the inn (now called The Prince of Wales) are still in being today and are owned by the Trustees of the former Borough. Portreeve was also the Borough Coroner. Schools were held here from time to time from the late 17th century onwards, and a Chapel Sunday school that has sadly recently closed, is recorded here as far back as 1847 It was also much in demand for local functions and celebrations, particularly the Mabsant revels held to celebrate the festival of the local patron saint. A description of one such relates how the older members of the community occupied seats around the walls whilst the younger element danced to the music of a harpist perched on the huge table that still occupies the end of the hall today. According to legend it was at one such gathering that Elizabeth Williams, 'The Maid of Sker', met and fell in love with the harpist Thomas Evans. Records show that the hall today is substantially as it was in her time. The fireplace at the east end has now been blocked off, but the table and wooden settles at the west end are as they were then. On Court days these seats were occupied by the officers of the Borough with the Portreeve (and/or the Constable of Kenfig Castle) in the centre beneath a painting of the Borough Court of Arms. The two windows at this end are so positioned that whilst the light fell on those assembled before them, they themselves would have been in shadow emphasising the mystery and majesty of their station.